Assistant Professor, Animal Behaviour and Ecology, Indian Institute of Science, Education and Research, Kolkata, India. A dog is a man’s best friend. But 80% of all of the dogs in the world are not actually domesticated. What do we know about this large population of stray animals? In our interview, Anindita Bhadra tells us what she found in her 5-years study of stray dogs in India. How dogs change people, how people change dogs, and how dogs can understand and socialize with humans. Anindita: I’m Anindita Bhadra, from India. I’m a behavioural biologist, working on street dogs. Nerina: How did this topic get your attention? Anindita: Well, I had already done my Ph.D. on animal behaviour, and at the end of my Ph.D. I was thinking of what to now start working on and wanted a very Indian model system. So, the dogs seemed to be the perfect model system because you have dogs everywhere, in every street in India, they are easy to work with. You don’t have to haggle for permissions with the forest officials and nobody has really extensively studied dogs in a natural habitat until now. There’s a lot of work on pet dogs and people work with wolves to try and understand dog evolution, but I felt that dogs which have been surviving in natural populations for centuries on our streets, are a very good model system for understanding dog evolution, and also for doing many other things which address basic questions in animal behaviour, ecology, and evolution. Nerina: What are the biggest challenges? Anindita: One of the main problems is that they’re all there and are completely mingled with people, so we have to do all of our work on the streets. Firstly, not every student is comfortable working in that way, and, while we are doing this, we have a lot of trouble keeping people away and stopping them from disturbing our experiments. There are too many inquisitive people asking questions, some actually saying “we will not let you work with the dogs in our neighbourhood” and “what are you doing?” and “we’ll call the police”. So, that is one problem that we have all of the time. Another problem which is a very peculiar problem in my case is; because it’s dogs, there are some people who love dogs and some people who hate dogs. It’s very difficult to be neutral about dogs. I often get students who come to me because they are already interested in dogs; they have pets in the house and they really are in love with dogs. I’m very scared of taking up such students for a Ph.D. because they can actually bias the data through their love for dogs. They start interacting with the dogs they are working with so it is very difficult to tease out what is real data and what is biased data. So, this is a peculiar problem that I face; dog lovers are not really good people for me. Also, I cannot use people that are scared of dogs, or hate dogs. It’s very difficult to find that neutral population who are still interested in doing my kind of work. Nerina: What did you find out, that surprised you? Anindita: One of the surprising results that we found was that- in the literature there was this notion that dogs don’t have stable family groups, unlike wolves. So even when they are in groups, these are random groups. But, we are seeing more and more that that’s not true. There are family groups, and we actually saw that there is a lot of cooperation between members of the groups, even in raising the pups. So, two females would have puppies at the same time, and often they’ll help each other in raising each other’s pups. There are also males which hang around with the females and take care of the pups; they play with the pups, they give them food, and protect them. These are probably the fathers- but we don’t know as we have not done any genetic analysis- as not every male does, only some do. I like saying this is like the typically Indian giant family system. It’s not like the wolf system, where only one dominant male mates and everybody else just has to help. Here, everybody is mating and all of them are having puppies, but then they are helping each other out just like in a large family; cousins, nieces, nephews and grandparents- they are all hanging around together in the vicinity. That’s a very interesting and surprising result. Another result- which, of course, we were not very happy about- is from when we did a 5-year long study to understand growth rates and death rates in the population. We saw that nearly 81% of the pups born in the year don’t reach adulthood. By 7 months 81% of the pups are dead, and nearly 60% of the mortalities are actually caused by humans. Of course, there are some cases where there are accidents which are not in our control, but then there are also active killings. So, that was a result which we didn’t expect, and it was also not a very happy result. Nerina: How is the situation of stray dogs worldwide? Anindita: It’s very interesting because there have been studies to estimate the populations of street dogs across the world, and it seems that nearly 80% of all the dogs present in the world are strays. Street dogs are still the majority, but, of course, they are more common in the developing worlds, than in the developing nation, because of the way the laws are. Here, in our country, on the one hand, there are the municipalities trying to cull dog populations but then they don’t have very extensive dog control programs, so there’s still a problem. You get reports of some dogs chasing or biting somebody, and this creates a lot of uproar. But then there is also a lot of dog loving people in the population; they put out food for the dogs regularly, and they care for the pups when they are around. So, there is a very mixed kind of feeling. In the Indian culture, in particular, it’s very interesting because dogs are considered to be lowly animals. Look at Indian literature from 2,00 years or 3,000 years back, then you have literature which talks about dogs on streets, and these dogs are very similar to the dogs of today. They’re just like outcasts. But then, a good householder is expected to feed these creatures at the end of the day, after the meal- the leftovers are not supposed to be thrown away, they are supposed to be fed to the dogs. So, that makes a very interesting kind of ecosystem where the dogs are not part of our households but they are part of the community. Nerina: You are also working on dog’s cognition, could you tell me more about this? Anindita: So, we are doing these experiments on dog cognition. People working with pet dogs have shown that the pets are very good at following human gestures, but wolves are not. Of course, there’s a problem, as pet dogs are brought up with humans, and there is intensive training. So, we are doing these experiments with stray dogs to find out what really innate dog ability is, and what comes by interactions with humans. What we saw is that really small puppies that are still dependant on and suckling from their mothers, are not really interacting so much with humans in the streets, but those which are 4-6 weeks old are excellent at following human gestures. If you put a bowl down and point towards it, the pup will go towards the bowl. Then we tested the juvenile’s cognition, which is at around 4-5 months, when the maximum mortality due to humans occurs. They are weaned from their mothers and more-or-less independent; they have started forging, and are also a bit of a nuisance for humans because they are very active. At this stage, the dogs are very reluctant to follow human gestures- they do not follow pointing, they do not even respond to the task. However, when you don’t give the gesture and just put down the bowl, they respond. So, they are still eager for the food, but they are very reluctant to rely on humans. What is surprising is that with puppies, we found an innate ability to understand humans and a tendency to socialise with humans. However, with negative experiences with humans, they probably learned quickly not to rely on them. What we are thinking could have happened in the past is that with this innate ability to socialise with humans, puppies who come to humans and get a positive response gradually become more and more friendly, and turn into pets. But, if they get a negative response from people they move away, and probably just remain as strays. This could have been the early stage when domestication was happening; some dogs became domesticated and some didn’t. So, this is a very interesting scenario that we have just found. Nerina: Did dogs change humans, or did humans change dogs? Anindita: That is a completely open question that everybody working with dogs is trying to answer, and frankly I don’t think we have an answer to it. I think the most optimum answer would be that it’s a bit of both. They changed us a bit, and we changed them a bit. From the current understanding, dog domestication probably happened around 20,000 years ago. At that time, humans were still hunting animals, and all other domestication events happened after that. Since we don’t really understand exactly what happened during the domestication of dogs, this is still an open question. We don’t really know. Nerina: Is there something you would like people who have pets to know about dogs? Anindita: One thing is that pet dogs have been bred artificially for so many generations that I think they are inherently very different from dogs on the streets. But, a feeling that I have always had, and with my studies is becoming more and more relevant, is that dogs aren’t very social creatures. When we have pets we like to think that they are part of the family and that we are their group, but it’s not really so right. The interaction you have with another human is not really the same as the interaction you have with your dog. Of course, the dog can interact with you, but it cannot speak its own language with you. So, I think if you want to have a pet, the minimum you can do is give it another dog partner because they need to socialise. They have a lot of interesting interactions and communications with dogs, and are such social creatures that it’s probably not fair to have just one dog as a pet. Nerina: What does it mean to be a woman, a scientist, and a mother in India? Anindita: It means that my days are pretty tough, to begin with. There are, of course, problems, because we have a lot of people with prejudices who think women should be taking care of children and the family. Even in Indian science, there are people who think like that, but I have been brought up in a very liberal-minded family. My grandparents always wanted me to study and become a teacher, and my parents let me do what I wanted to do, so I have never been used to this kind of social system where being a woman is different from being a man. I haven’t faced too many hurdles, until I came to the professional world of actually competing for a job. There I realised that yes, there are problems; men and woman are not always treated at par when appearing for a job interview, and as my husband and I are in the same field and at the same institute, it often feels like we are treated as a unit and not always as individuals. But, in general, I think the majority of people in India respect woman scientists. There is a lot of understanding from the Indian government, which insists on having day-cares in the institutes. So, now there is a lot of understanding of the woman scientists needs; you need to have a school on the campus, and you need to have day-care so that you can be a mother and have a career at the same time. So, personally, I haven’t really faced too many issues being a woman. However, there is discrimination, there is sexual harassment, and often there is bias. No one will say it to our face but, when somebody says “oh you have done this, being a woman” I feel very bad. Why can’t you just say “you have done this, this is good”. That’s good enough, you don’t have to say it’s even better because I am a woman. I don’t think in those terms when I do my science, I just do my science. Whether it’s good or bad, it should be judged on an objective scale, not based on my gender. Nerina: What do you like doing, when you are not working or researching? Anindita: Cooking, reading books, listening to music, and I do a bit of painting. My weekends are mostly taken up as my husband and I have a theater group so we often have rehearsals. If I’m not doing research, I’m doing theater. My free time is mostly for my kids now. Nerina: You are a scientist and an artist. What has science to do with art? Anindita: I firmly believe that if you are a good scientist, you need to be creative. You cannot say that science is science, and the arts are the arts. Whenever you have crossed between disciplines, you have more creative thinking. I have always had a creative kind of mind, I used to dance when I was 4 years old, and I haven’t stopped. But, when I trained to be a scientist I never felt the need to stop indulging in the arts. I actually think every student who is doing science should have some other interest outside science because you cannot just live within the small sphere of your science. Science is becoming more specialised day by day, if you are only doing your bit then you do not know anything about the world; you cannot have lateral thinking, you cannot have different ways of applying your knowledge. You need to have an understanding of literature, social science, and history, to be more creative in your science. Nerina: Is there a project, or an idea, which you are really passionate about at the moment? Anindita: A lot of things, actually. Other than my research, I’m currently extremely actively involved in the Indian National Youth Academy of Science and this is in a way my baby as I helped in founding it. This is not just an Academy, it is almost like a new movement in which we are trying to start getting young people actively involved outside of their research, in taking science to young children, getting involved in science promotions, science diplomacy- something that Indian scientists rarely do now. Everybody thinks that the older scientists should do this, and the younger scientists should just do their research- including the young people themselves. But I am trying to tell them no, this is your social responsibility. You are doing your science, fantastic, but what are you doing for society? This is my way of telling people to come and join us, this is a platform to do something for the society which is giving you the funding for your research, to begin with, right? Nerina: What is the role of science in your opinion? 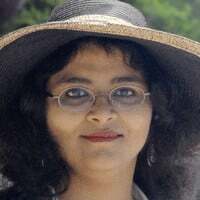 Anindita: Science helps you to think, reason, and analyse. Especially in the Indian context; we keep telling Indians that one of the things we would like to do is help people believe in science and practise it as a way of life, not just as a profession. When students are reading science they are normally reading it because they either want to become an engineer or a doctor, or a scientist, but beyond that I think the responsibility of the scientist is to come out of his or her own sphere, step out into the real world, and make science easy to understand for the common people, and for children, so that people get interested in science. So they don’t say that “I’m doing my science, and only I understand my science. You are dumb, you do not understand” that is not the way we should do our science. We should do science, good science, and then break it down to the language of a child. I should be able to explain my science to a 5-year-old, to a 10-year-old, to a 50-year-old, who have not done science. I think that is a very big responsibility that scientists have because science is so important and you need to bring in the methods of science to solve the world’s problems. You need to bring in the methods of science to address basic questions. In India, we have so many superstitions, and this is very ingrained. People have fear, religious beliefs, and superstitions. There are these stupid class divisions, there are still people who practise very rigorous rituals which are completely based in superstitions, and completely baseless. But, you cannot tell them “you are doing this, this is dumb”, you need them to realise “this is dumb and so I should not do this”, and the only way they can realise this is if they start understanding logical reasoning, and start asking questions. This is, I think, the most important job for scientists; to help people ask questions and find an answer. You don’t just give them an answer; you help people to find the answer. Nerina: What makes life meaningful? Anindita: For me, it’s very important to put human beings first. I like to do things for people whenever I can. I really cannot say I will go and solve all the problems in the world, but in my capacity, I like to do my bit and since I like working with children and I’m interested in education, I like teaching. The way I want to solve some of the world’s problems is by engaging young children in discourses, in getting them fascinated about nature and science and helping them to ask why. Especially in our culture, you are always told to obey your elders, respect your elders, do what you’re told, and don’t ask questions. So, if I can motivate even a small part of the population to say “no, I will ask questions; at every step, I need to know why” then I think I have made a good contribution to the society of the future. For me, life is good if I think at the end of the day I have done something positive, that could be a very small thing or it could be a big thing. For me, my life is meaningful if I’m able to do something which is outside the small sphere of my family, or my set of students. So, if I have been able to contribute to society at large, even in a small portion- maybe I have made a student get interested in science and do science, or persuaded a family not to get their daughter married off when she is 15 and instead allow her to have an education and a life of her own, I think that is a contribution I have made to society. Nerina: Thank you so much Anindita.